viewfromaloft - According to 'Wiki', Eastside includes North East L.A. According to 'Wiki', Eastside includes North East L.A.
Wikipedia is not the most authoritative online reference site, and most users know that historical facts, as edited by it's readership, may be conceptual at best. 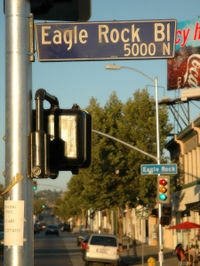 Still, it was entertaining to see the listing for East Los Angeles (Region) clump the Eastside, East L.A. and the “broader eastern region of the City of Los Angeles” with this photo of an Eagle Rock Blvd street sign. That's too broad. According to Wiki, Silver Lake and Echo Park is the area “locals have come to use the term ‘Eastside’ for the region (to counter with ‘the Westside’." 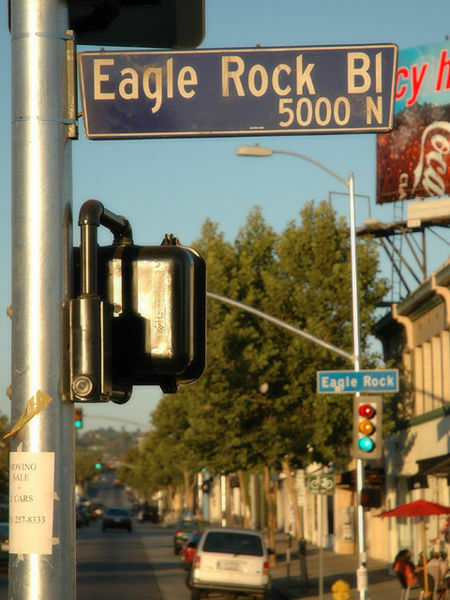 Then the history is mostly about East L.A. and Boyle Heights. The Cho-lo-sphere may have something to say about this sign that's located in Northeast L.A. Highland Park and Hermon! Welcome to East L.A.! I was listening to the NPR show Day to Day yesterday and they described Charles Bukowski's former bungalow in "East Los Angeles!" Talk about East Coast ignorance, just unacceptable. If Day to Day did some research they would have found 5124 De Longpre Avenue near Sunset and Normandie in East Hollywood. That's not even near any version of eastside, much less East L.A.
hey, i don't know about extending the borders all the way up north to colorado; but lincoln heights is, after all, the original east l.a..... least it was a century ago. so it's kinda nice seeing a bit of history tossed into the mix, inadvertently or otherwise. I based East LA on––and it's my point of reference only––that with Main St dividing the city's east and west addresses, it begins a civic dividing line. The river is a cultural border, and you can continue North Main as the civic division as it heads into Lincoln Park (once known as EastLake). Even though Lincoln Heights is one, if not the first "suburb", it's north of L.A. as the river bends toward the west. Because of the high school walk-outs of the civil rights era, I place them as an historical participant of East L.A.'s "Chicano" movement.